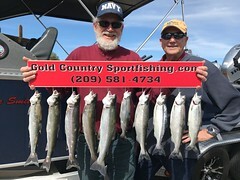 New clients Dan and Todd were onboard with me on Saturday the 16th of March. It was great being out again due to all the rainy and stormy weather. 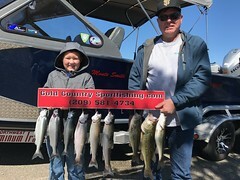 I Knew the fishing would be challenging with the rising and dirty water, however I was very confident that we would catch fish, so after meeting at the lake and launching the boat we were soon setting lines and away we went it probably took 30 to 40 minutes before we had our first strike and hookup and we boated our first fish and after finding where the fish were holding we continued to find some action along with lading some a loosing a few. The day was a beautiful day to be on the water with the warm sunshine on us. 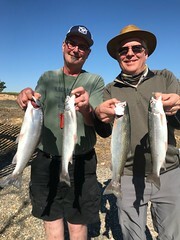 We made a move to different water as the bite died and after a long great day on the water they ended up with just four fish, but we had the opportunity of eight fish. It was still a great day with two great guys. Thanks again!!!!!!!!!!! !